Not all stocks are created equally. That is especially the case in the market currently, where volatility is back amid rampant trade war fears and Facebook's (FB - Get Report) sub-par second quarter. Some stocks are managing to hang in there as investors re-price risk, while others have taken a beating on worries about the underlying company's profit outlook. "Thinking back to what should be the right balance in your portfolio ... now is the most important time in eight, nine, maybe 10 years to rebalance that," says Jeff Kleintop, chief global investment strategist for Charles Schwab Corp. "It's hard to sell the winners and buy the laggards. Emotionally it's really tough to do and it doesn't always work. But I think we're at that point where the leaders and the laggards kind of start to reverse. That could take a big bite out of people's portfolios that haven't reversed." If there is a new moment of truth on the horizon for markets, as Kleintop suggests, fundamentally shaky companies could be whacked even further. Even fundamentally strong companies may come under pressure as Wall Street is forced to recast its profit projections. 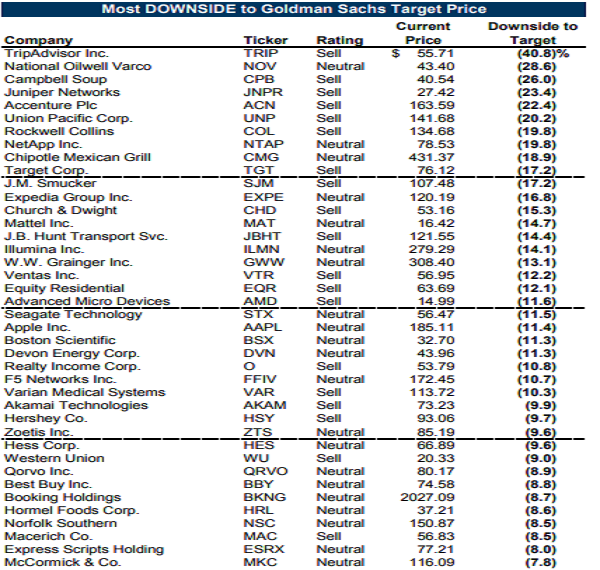 Here are 40 companies Goldman Sachs thinks have considerable downside risk. These are the great stocks Jim Cramer's Action Alerts PLUS member club are holding right now.